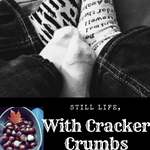 About | Still Life, With Cracker Crumbs..
My husband and I dreamed for a long time of having a child. Then one day, long after we had given up hope, we learned that surprise, surprise, one was on the way! Thus beginning our lives as parents, at forty. We had a long journey to get there, and our path wasn’t always easy – but always, always worth it. Never a question or doubt about that! Our son is the sweetest, most adorable, affectionate, tough, stubborn, determined, and comedic kid – I call him my sunshine, since he brings the light and joy. Sunshine Boy also has cerebral palsy. He was born two months early, with two brain bleeds, and required two brain surgeries within six weeks of being born. We are making our way through this new world too, of special needs parenting, learning the ropes, new vocabulary, therapies, and all the rest. He is also a small guy, who is not the best eater ever, with gross motor delays and speech delays. But he works so hard, and everyday he amazes us, even if it’s just with the sweetness of his smile. We always joke between us, about how we had all kinds of time before. We went out to new restaurants and cool bars, we had hobbies, a cleaner home, but really, this is still life. Just with cracker crumbs. And slowly we are making the adjustments and finding the balance. We are loving every minute of it, and love remaking our lives with our adored boyo.